Let’s take a look at the typical process providers go through to complete documentation for billing. First, Direct Care Staff fill out a billing sheet with their start and stop time and submit the form to the biller. 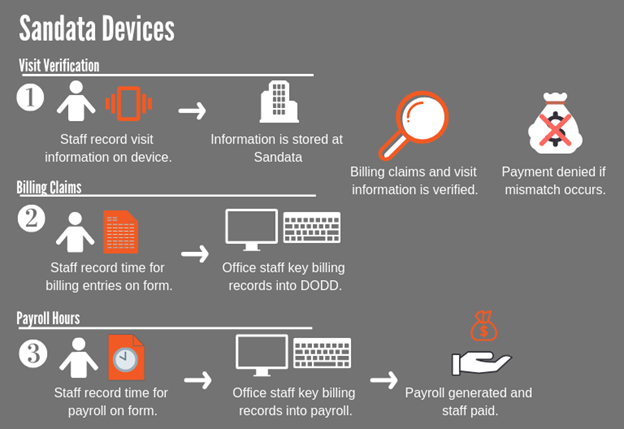 The biller then has to key that information into DODD’s system for payment. In some cases, direct care staff also have to complete timesheets for payroll and then office staff key that information into their payroll system. In the EVV world, direct care staff will also have to clock into the Sandata device while at the service location. 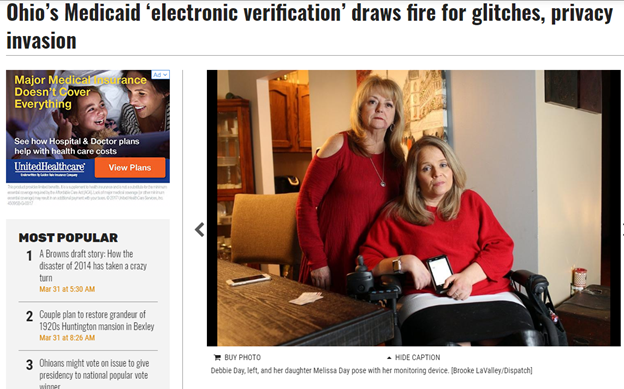 Eventually, the visit information captured on the device will be used to verify the billing claim and if they don’t match the claim will be denied. When using Advisor Anywhere, providers can worry less about matching billing claims and visit data because Anywhere captures claims, visit information and payroll hours from the information recorded by staff. 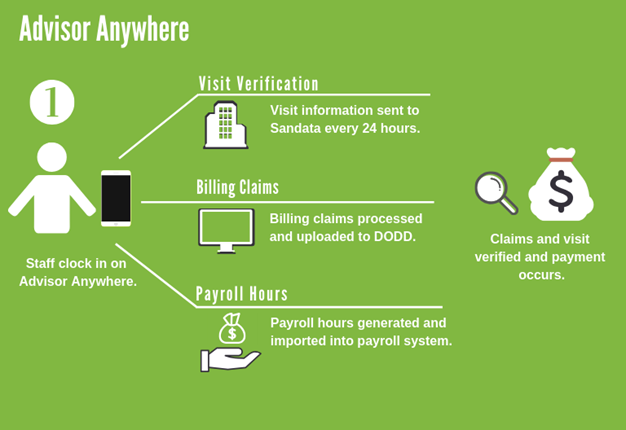 The same information that is submitted to Sandata for visit verification is the same information that is submitted for the billing claim. This is also the same information that is submitted for payroll hours. By using that single data point and skipping the billing and payroll data entry, providers eliminate the areas where visit information and billing claims could be different and the risk of delayed claims due to mismatched data is virtually eliminated. While Medicaid has committed to communicating with individuals prior to receiving their Sandata device, providers will also want to prepare to take on some of the education themselves. As with other statewide initiatives, providers often receive the brunt of the anger from individuals and family members when they begin the education process. Providers who use Advisor Anywhere can eliminate the administrative cost and educational headache of informing individuals and families about the device that will show up at their home because no device will arrive. Advisor Anywhere is a website that is accessible directly from the staff members’ GPS-enabled phone, tablet or other device. No new device means no new education for families and individuals. 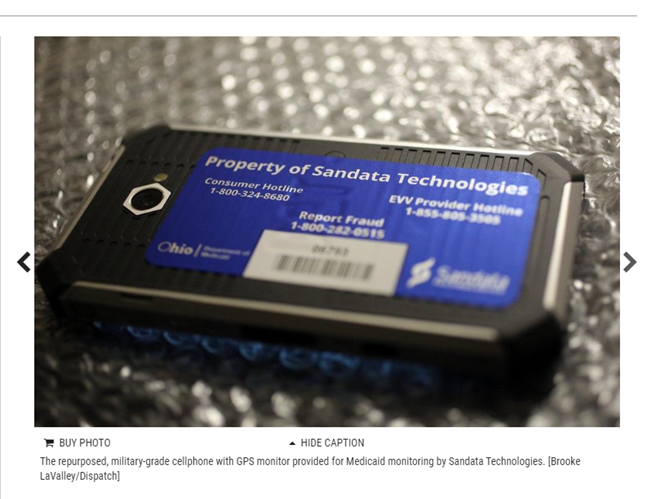 Providers using the Sandata devices may be faced searching for the Sandata device while in the consumer’s home. We can only imagine where they may turn up. Instead of wasting time searching for missing or replacing destroyed devices, providers who use Anywhere can feel secure knowing staff can use their smart phones to login and capture the visit information required for EVV. Sandata is an organization based in New York. Based on the experience of providers, they should expect to navigate a bureaucratic system that is less than user friendly. Imagine having questions or lost devices and getting a recorded system when you call for help. When providers use Anywhere, they get all the perks of working with an Ohio company including an accessible and knowledgeable support team, on-line documentation and videos and free webinars. We’re here to help make this process easy.